England went into this game clear leaders in this group with their opponents sitting in second place. A 3-1 win at Wembley extended the group lead to an almost unassailable 6 points, with England now 4-4 in qualification games. With that all said, England are still not operating at the top table of International Football, and and times were frustrated by a far weaker team. Today was Rooney’s day. He was playing in his 100th game and was presented with a golden cap from Sir Bobby Charlton. This may of been through gritted teeth as I have covered on my last England visit. England set up with some new blood at full back with Nathaniel Clyne and Kieron Gibbs, coming in for the established, Leighton Bains and Glenn Johnson. This offered some pace on the edges of the field, which was going to be needed with the pedestrian midfield of Wilshere, Henderson and Lallana playing out of position. I am getting fed up with moaning about Wilshere and how he is not a holding midfielder, but there he was again. Henderson can play that position and does every week, but he is pushed up the pitch at England level, and plays alongside his team mate Lallana. I say team mate, the guy hardly ever plays for Liverpool, and also should not currently be an England player. If you want two holders and a traditional midfielder to play off Sterling, how about Henderson, Noble and Wilshere (further forward). This poor line up (positionally) meant England had no shots on target in the first half. Every ball forward went to Rooney, who was doing his damnest to score, at the expense of Sterling and Wellbeck. Shocking first half. The playing style was typified by a Jordan Henderson OG admittedly against the run of play in the second half. This seemed to spark England, with the reply almost instant, as Rooney got in the box and won a penalty. Personally I don’t think he was touched at all, and I had a great view. Rooney stepped up to get another goal for his tally, and England really pushed on from there. All of a sudden, the team realised Wellbeck was playing and in his usual lackadaisical style he added another 2 goals to his tally, with Sterling interchanging well with the Arsenal striker. If he keeps getting these goals, I think Rooney’s stint at the top of the scoring charts may be shorter than Sir Bobby Charlton! Yesterday, my companions for games were the Aldershot duo of Ian and Albert. This was young Albert’s first visit to Wembley and being used to 1.5k at the Rec meant that nearly 90k in attendance was pretty awesome. I’m sure he had a great day out, and hopefully will see better performances in the future. My MOTM was Wellbeck, and whoever voted for Wilshere, as was announced at Wembley, needs to take a long look at themselves. One last thing, as regular readers will know. I am a recent convert to NFL, BUT the state of the pitch was shocking yesterday, covered in wrong coloured strips of grass, and the remnants of the gridiron pitch layouts and lettering. Just behind the goal was COWBOYS, and the yardage lines all up the left wing. This is our national stadium and our national game. This needs to be sorted. I’m sure it’s not to hard to use overlays for the non playing surfaces. The stud marks all up the middle didn’t look too great either, but didn’t seem to effect the roll of the ball. Click on the photos to see what I mean. Enjoy the pics (taken with a recently acquired low end Canon DSLR). This is bigger than the Rec ! Not a lot to report here if I’m honest. 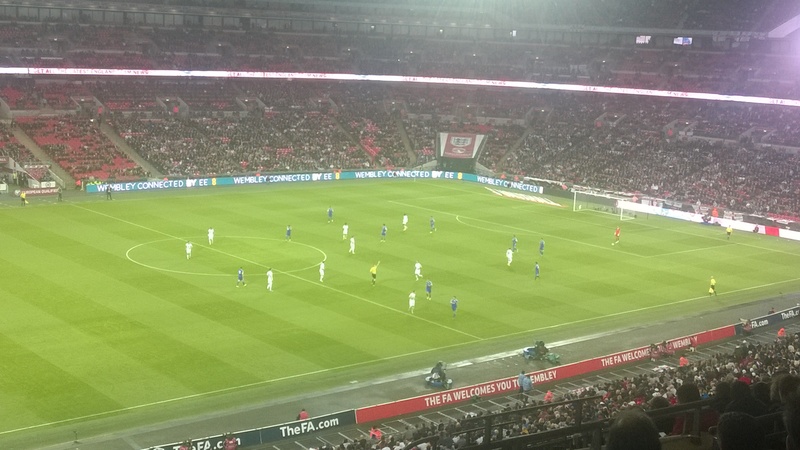 England played the eternal minnows last night, and I was fortunate enough(!) to get a box invite, so I got myself along to Wembley to watch. First things first. England won 5-0, Joe Hart could of sat next to me, and the score would of been the same. I should know better as I went last time as well. As I was finding my way around the corporate hospitality level of Wembley I bumped into Adrian Chiles. For those who don’t know he hosts the England games on TV on ITV. Seemed like a nice fella, and gave me the tip of 2-1 England, last minute scrappy winner. So obviously, his ill fated sojourn to breakfast telly hasn’t dulled his sense of humour. We also had a chat about West Ham, and he was enjoying it so much he missed his studio door, and wandered off with me, as he was being chased down the corridor by some TV types. If I tell you that this was the highlight of the evening, then you can guess why I’m not reporting too much on the game ! Anyway, what did we learn? Jack Wilshere. I will be honest and say , that I didn’t realise he was actually playing until about 70 mins, he was that anonymous. Whether it’s the system or him I don’t know, but he needs to be moved out of the England set up until he can prove he can operate at this level. Anyone can have the odd flash of brilliance, but to be an international you should be at that level all the time. Chambers and Gibbs kept a clean sheet, but hopefully with England way ahead in the group now, they will get a chance against Estonia / Slovenia, to see if the can compete against better international sides. My last point is Wayne Rooney. Another win for the captain, and another goal, and maybe if England hadn’t fannied around with the ball so much, he could of got more, BUT. This puts him 7 short of all time record scorer Bobby Charlton. Maybe I’m just being just an old man, but it should be taken into consideration that Charlton was scoring in top level internationals, and not games against Italian postmen. Maybe we should initiate a FIFA style ranking system for the worth of a goal, and I’m sure Sir Robert C would be way out there with Jimmy Greaves, and everyone else way behind. San Marino keeper with the ball. He actually made more passes than anyone else in his team ! I could do a report on the game and who did what, and when things happened. But, as the whole world knows, England lost and their WC dream was hanging by a thread. Since then Italy have been beaten by Costa Rica, rendering that dream smashed on the dressing room floor. And so, the World Cup comes round, but this time with a difference. 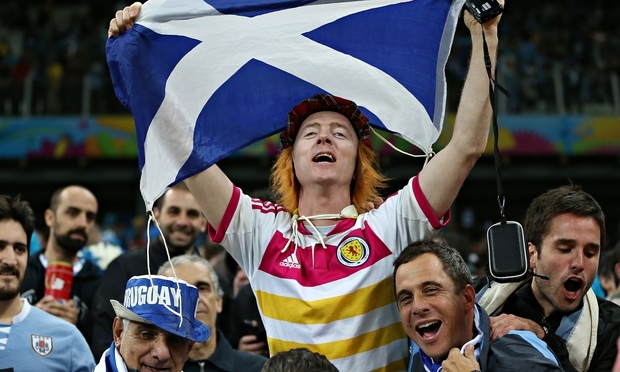 The usual jingoism and self believe that usually hits the UK media every 4 years has been very subdued this year. For good reason as well, as although England qualified for Brazil 2014 with only a small wobble near the end, they haven’t exactly been tearing up trees with their performances since their exit to Italy in Euro 2012. I have witnessed first hand more than a few of those games and have reported on them here and via Twitter. Underwhelming just about sums it up. So the nation expect little and we lose our first game out in the WC, 2-1 to Italy. About right i hear you say. STOP. 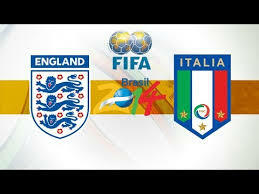 Last night was about the best England performance I have seen since Rooney hit the big tournaments in 2004. The mix of youth and experience was right and England played some good attacking football but just lacked that killer instinct to make the last pass or take an extra touch. I think England can come out of the group in second place (I have thought that since the draw), and then it’s anyones game. How can we make this team better ? First off, and this is a simple football tactic that most managers seem to struggle with. Play your best players in their best positions. Rooney on the left? really ? Yes he made a great cross for Sturridge, and he says he will play anywhere for England, but it is a waste. The manager obviously fancies Sturridge and was vindicated, but he now has to be brave. Either 2 up top or drop Rooney for a real winger. With two up top, there would be no room for Wellbeck, but Sterling can sit in a real no 10 position and Wilshere can come into midfield, and needs to push further up and let Gerrard sort out the defensive part. Wellbeck has proved he is an impact player for United so no worries on that score, and it allows us to mix it up , up top. Rooney is already looking uncomfortable and if he is to play, he needs to be doing his business right up top. We also need to pass a little more.We have the players, we just need to be sure in the technique. And that involves Roy and his team employing a little discipline into these lads. Easily done. Watch the Germans, and repeat. Lastly on the team front. Ross Barkley? I just don’t get it. I’m sure he will get better, but he just seems to lose the ball all the time. Pointless to me why he is even there. James Milner would be better. There, I’ve said it ! Talking of Everton players, his teammate Mr Baines found out last night how Ashley Cole got 100 caps. He was not consistent, and got lost in allowing the cross in for the Azzurri’s winner. You could argue that Gerrard had a penalty shout, but that was that and the Italians are half way booked into the next round. That said, I believe this new look England will gel in time, just not this competition. Sterling was sublime, and Sturridge always look lively, and surprise of the night for me was Jordan Henderson starting to look like his price tag. England MOTM: Raheem Sterling. All day long. The boy is scared of no one. After an unbeaten qualifying campaign and littered with too many draws, Roy Hodgson’s England need to win their remaining two games to secure qualification to next years World Cup. Both are at home, and the right results are possible, but first up were Montenegro, who England have had four previous tussles, all ending in a point a piece. The weather was shocking and travel was not much better with an hour delay at Ebbsfleet. The tube trip went a little old skool when a north south divide looked to kick off on a packed train. So a lot later than expected we took our seats and i was quite pleased to see Hodgson had picked a remarkably attacking formation with Rooney, Wellbeck and Sturridge all starting. Also starting was Tottenham’s current flavour of the month, Andros Townsend in front of his team mate Kyle Walker. Joe hart was in goal following the worst run of his career, cementing the manager’s faith in his no.1. The initial play was pretty cagey with England getting the odd chance and as usual at Wembley this set the tone for the rest of the half. Just before half time, England had their best chance when Wellbeck tried his usual reverse back heel to no effect. He needs to cut that out of his game. The second half started better with Rooney getting on the end of a Wellbeck shot that deflected into his path. England pushed on post this and got their second when a Wellbeck shot was deflected towards goal from its initial route by a defender to register an OG. OG is actually the 3rd highest scorer for England these days, just 2 goals behind Gary Lineker! 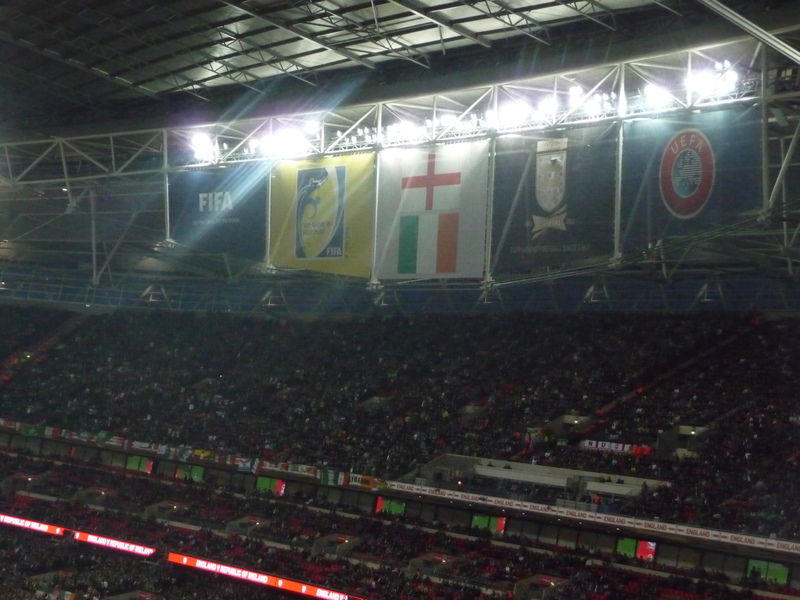 England looked comfortable and the subs started with Lamps coming off for Carrick. Then the away team scored and you could feel the tension. We knew the Ukraine had already beaten Poland, and so another draw would not be enough. The clouds dispersed when debutant Townsend smashed in a cracking low 20 yarder to open his account. This ended the game as a contest and the icing on the cake was when Sturridge won and scored a penalty just after the 90. The scoreline did not reflect the game, and England will need to step up in the middle of the park next year in Brazil if present. However the bold attacking formation was a massive positive as was the selection of Townsend (if only because Walcott and Lennon are injured). Let keep that up for Poland, and moving forwards as a more pressing team. This should not remove Ricky Lambert and Andy Carroll from the frame though, as sometime you really do need just to lump it. MOTM : Townsend. Looked completely comfortable on this stage. Tore up the wing like he did last week against WHU (thought i wouldn’t mention it? LOL). Rooney flashes one past the post. The season ended 2 weeks ago, since then we have had 3 Play Off finals and a Champions League final at Wembley. Last night hosted the last game of the season at FA HQ, a friendly for England against Ireland. 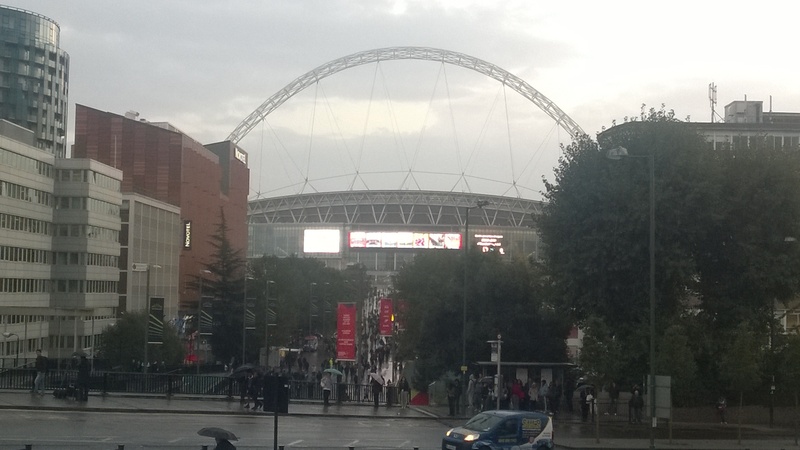 Interestingly enough, i was present at the last time England played Ireland at Wembley 22 years ago ! Doubly interesting, apparently i pushed past Louis from One Direction as we made our way up to our concourse. Roy picked a strong enough team, led out by our current petulant footballer of the month, Mr Ashley Cole, celebrating his first home game since he broke the 100 cap barrier. No Stevie in the middle, replaced by Carrick and Sturridge came in for the benched Wellbeck. The atmosphere was several times better than usual, as the FA relaxed their ticketing policy and allowed 26,000 of Irelands finest in the see the game. This makes a game feel like a real game and should be applauded. Apparently the same will be done for the Scotland game later in the year. This is great news but should be tempered against the possibility of trouble, more of that later. 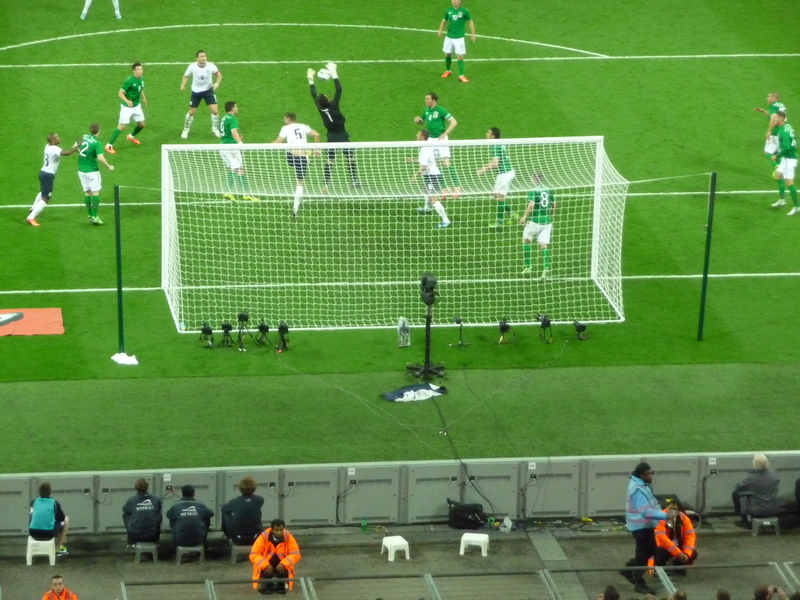 Ireland went for it from the beginning, and England tried to contain , with Rooney busting himself but getting little support. 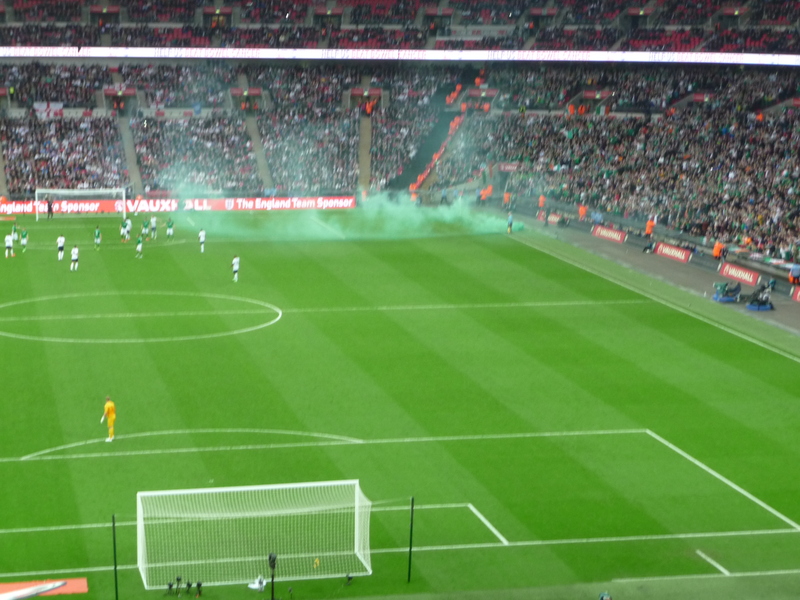 The Irish support smelt blood and willed their team on with louder and louder choruses of the Fields of Athenry. They were rewarded after 13 minutes when Shane Long beat both central defenders to the jump and dropped the header into the far corner beating Joe Hart all up. As part of the jubilation, this happened. Flares are back in fashion. I can imagine if it had come from the home stand, the press would have a different take on the “exuberance”. Anyway, England woke up and started to support the front 2, and payed that off when 10 minutes later Sturridge made a great run and pass that ended with Lampard getting his 29th England goal. Can Frank get another 20, in the 3/4 years he has left. Why not ? At half time as these things do, it all goes wrong. 3 subs for England (4 if you include Sturridge limping off after the equalizer). Fair play to Trappatoni, who made a sub every 10 minutes just to annoy everyone. Crap 2nd half. So 1-1, same as it ever is with ENG-ROI. 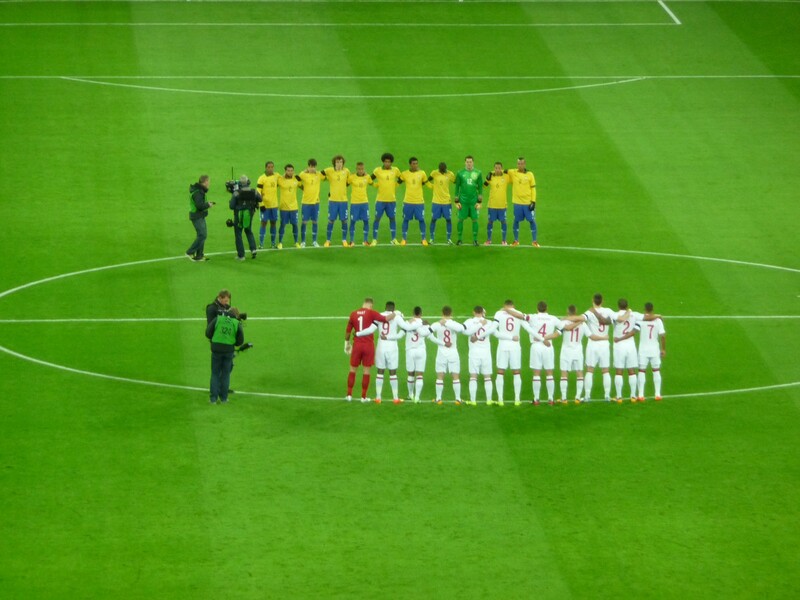 Nobody learned anything tonight, and neither will they in Brazil. Absolute waste of time. Having met superstars on the way there, life was slightly different on the way back. First off, i met West Ham Glen on Wembley way. WHG is a mate of mine but more importantly Aussie John who I have covered around these parts previously. I asked him where John was (they are massive England buddies). He has no idea as AJ had left some time before. Anyway, i get on the tube. As usual, its packed and we head off to Kings X. 10 minutes in I get a slap around the head. I spin around and am met with a giggling Aussie John. We also met someone I knew on the Fast Track back to Kent. And that ladies and gents, was the better game tonight. On a more serious note before i leave, myself and John were discussing how many away fans were in with the home crowd. Now this shouldn’t be an issue, but sadly it is. I saw no problems, but John saw a few in his area. On his way out he bumped into a senior England FA security bod. When asked what they were doing about it, he said and i quote “nothing to do with me !” What sort of answer is that ? Its everything to do with you, and that sort of behaviour will come to bite them on the arse when Scotland roll into town. I hope I’m wrong but experience tells otherwise. But hey, why work when you can blame everyone else. Growing up as a football mad kid in the 70’s, the Brazil national team was a thing a fantasy. Pele, Rivelino, Carlos Alberto and Jairzinho were in the pantheon of world football in an age where global travel was sparse and the Internet was the property of the US military. Yesterday, although an occasion, was England against 3 blokes from Chelsea, QPR’s keeper and the fella who scored against England last in 2002, and had just been recalled. So the key point was, are Ramirez, Ruiz and Cesar and co up to the mark on the international stage. Before anyone thinks I’m taking the piss, i do understand that between them, there were at least 5 champions league winners in the squad, and the fella on the way back has 2 Ballon D’Ors ! Also playing was the latest wonder kid off the samba production machine, Neymar. The England team look refreshing with Walcott allegedly starting up top with Rooney and Wellbeck. Ashley Cole made his 100th appearance which meant that with Steven Gerrard, history was being made, as the first centurions to ever play together for England. Jack Wilshere started in the middle edging out Frank Lampard. There was a minutes silence for both Munich and Bobby Moore prior to kick off which was observed by about all but 5 imbeciles out of 87000 + people. Once kick off got under way it was apparent that Walcott and Wellbeck were pushed out onto the wings. Talking of Wellbeck, there was one other weird stat. He had scored for England with every shot on target ! 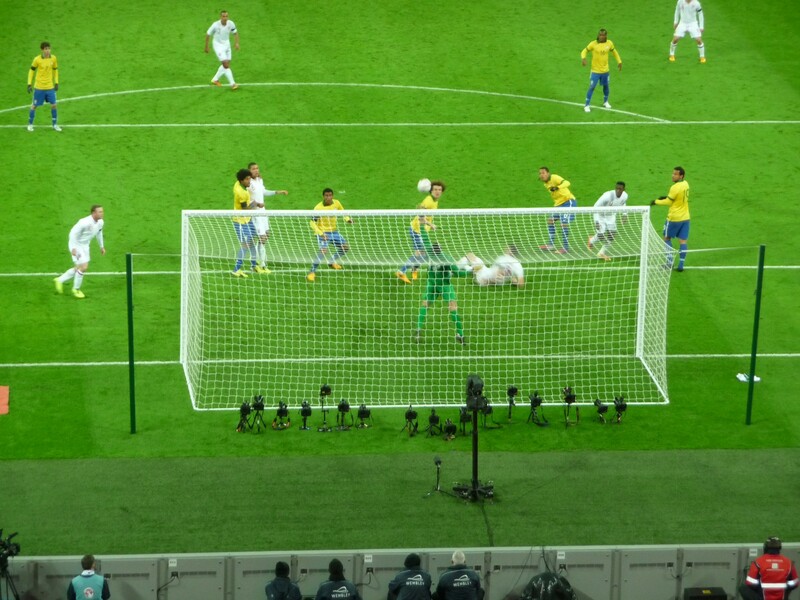 Wilshere was looking industrious from the off, but so did Brazil. The way they naturally move the ball around was great to watch but not a lot of end result. England were more direct with Wilshere tearing forward when he had the chance. On 19 mins Ronaldinho tried to cross a ball after some more 1 -2’s but the ball got as far as a jumping Wilshere, hit his arm, and a penalty was given. This was similar to the Ryan Giggs ball to hand incident here and not in my opinion a pen. So up steps big Ron, up against someone a little more agile than Dave Seaman this time, and takes his best. 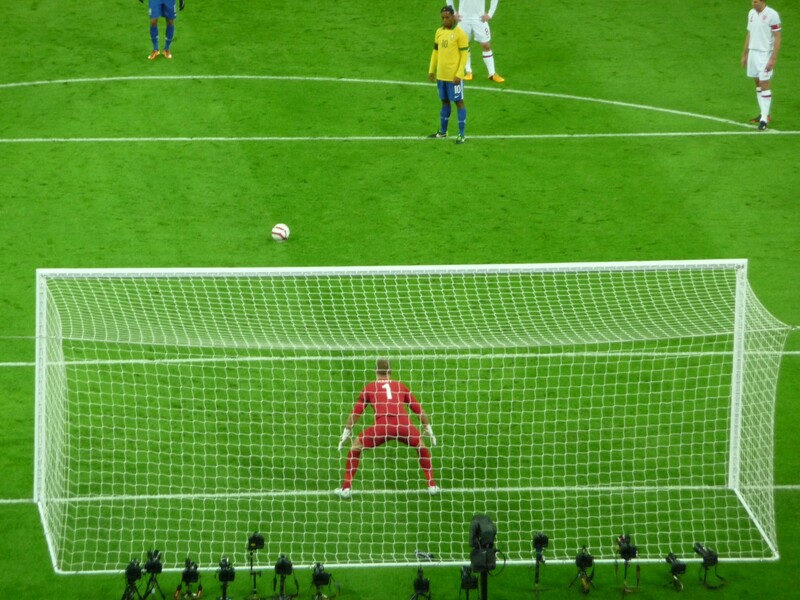 Joe Hart gets down to his left and makes the save, but the ball bounces out in the path of the incoming Brazilian. Hart stops again, and then Cleverley clears the ball and was lucky not to give away another pen in the process. Great work Joe, as he adds another chapter to the CV. Will he be this calm in a WC Final ? This deflated the visitors a little, and England started to push on . They finally took the lead just after the half hour mark, when Wilshere (again) burst through, slid a great ball through to Walcott, whose blocked shot came all the way out to Rooney, who smashed it home. England went into the break still on top. Half time brought the usual subs so the game should die off, but Brazil didn’t read that script, and came out all guns blazing. Within 3 minutes, due to a rare Cahill error Fred pull off a screamer to equalise and nearly did the same thing about 3 minutes later, just clipping the bar. England dipped hugely after this, but held on. Some further subs brought on Lampard. Who slotted in the Cleverley’s position but seemed to be more natural at moving the ball about. Walcott hit some fierce form in the middle of the half and seemed to be roasting the Brazilian left back at will. But instead of coming into the middle as he was he just hit the line and got the crosses in. Rooney went close with a header for his second, and you could sense the tide was turning. On the hour mark, following a pass back from Rooney, Lampard showed every bit of his experience to volley past Cesar, off the post, for the winner. Rooney hits bar and his backside ! So to sum up, Wilshere is definitely one for the future, and just needs to learn to shoot, or at least take on the responsibility. Scott Parker has had this issue as well, and it should be easy to fix. That said he was still MOTM. Hart’s penalty save was brilliant. Rooney was swashbuckling, Lampard seems to be beginning an Indian summer of his career. I will say the jury is out on Cleverley and Wellbeck. One last thing, Glen Johnson, good as you are, you are not Roberto Carlos, get back and defend, and stop leaving your position uncovered. 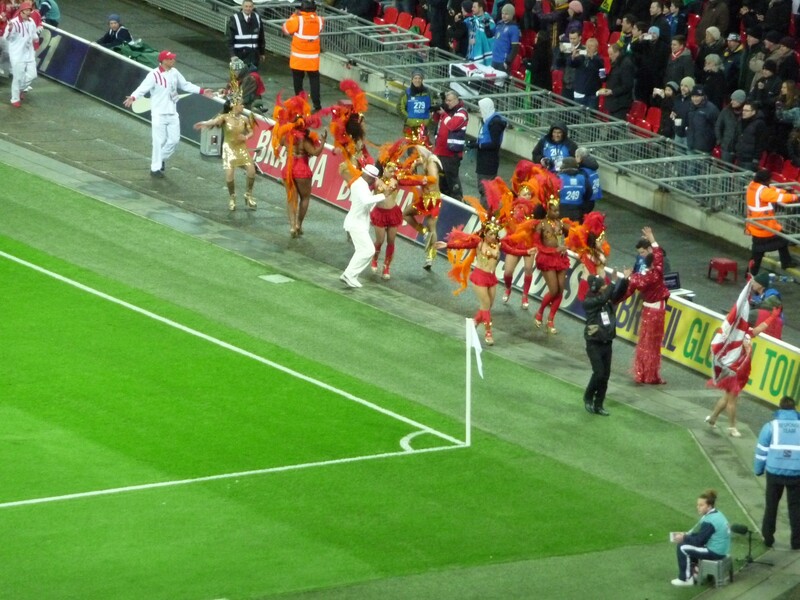 Half time random unannounced Samba dancers !